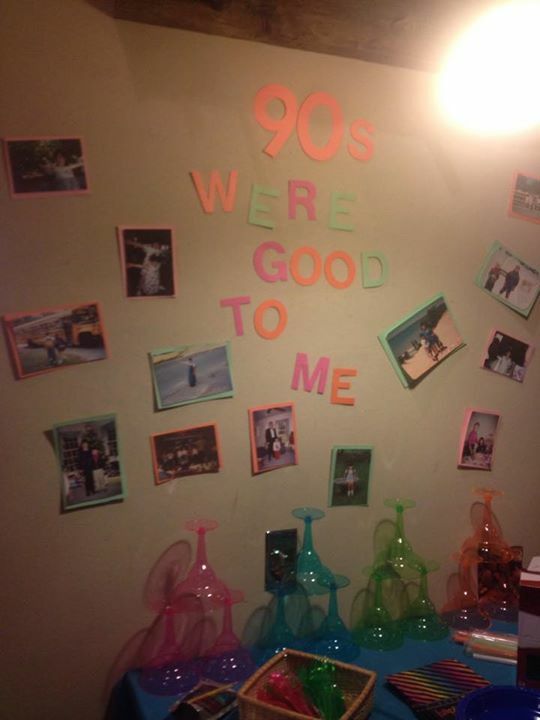 My totally awesome 90’s party! Since I was born in 1990 it is the first decade I have lived all the way through. 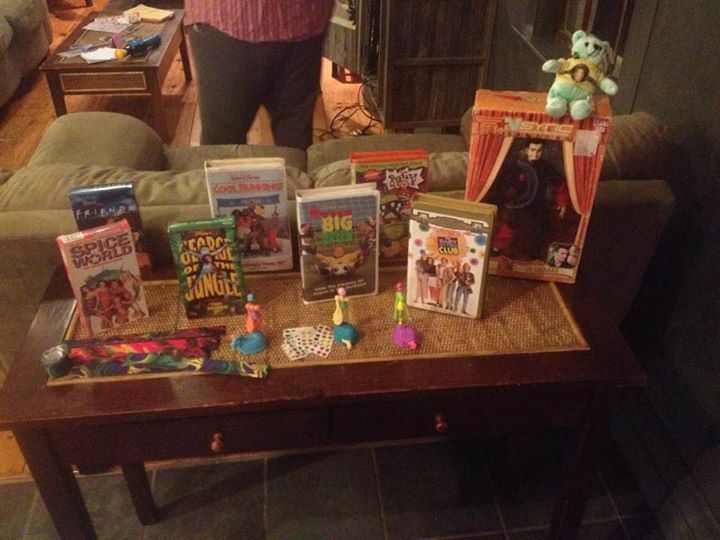 So the 90s memorabilia was different from maybe what other 90’s memorabilia someone may have. 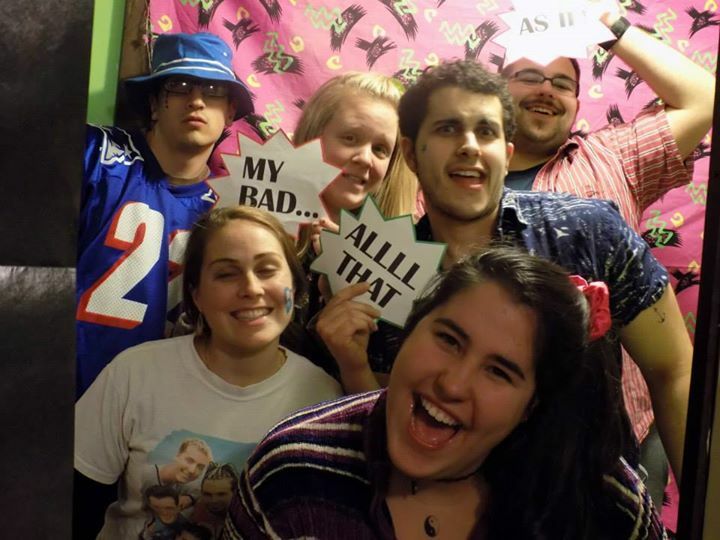 It was a greater portion of my childhood the 90s, and when people arrived at the party I wanted them to feel like they stepped back into their childhood. Most of the things I had were children centered. First thing to throwing a party is WHERE? I went on homeaway.com and found a house that was reasonably priced and was willing to let me host a party. (hard to find). It was on Cape Cod so it was the off-season; I thought it would be nice to people to be able to get away for the weekend. I calculated how many people would go, and then divided that number by the price, it came out to 30 $ per person per night. Can’t be beat! I read all those buzzfeed articles about 90s toys, 90s clothes. The first step I took was to go through my own things, I found my 90’s beanie babies collection. SCORE! I picked a few because I couldn’t possibly bring them all. I found an old polly pocket J. My happiest find was old NSYNC magazine clippings I once had taped to my wall. Next step was to raid friend’s attics. My best friends grandmother had a WORKING furby. Along with Toss across, twister, nickelodeon magazine, and a stuffed pickachu. One of my friends had a working bop it! Next step was to turn to Ebay for the things I couldn’t find around. I purchased so many little cheap things, Floppy Disk’s for coasters. I bought toys on eBay that I couldn’t find in my closet or friends, sky dancers! Extra posters, I needed some Brittney Spears and some more NSYNC. 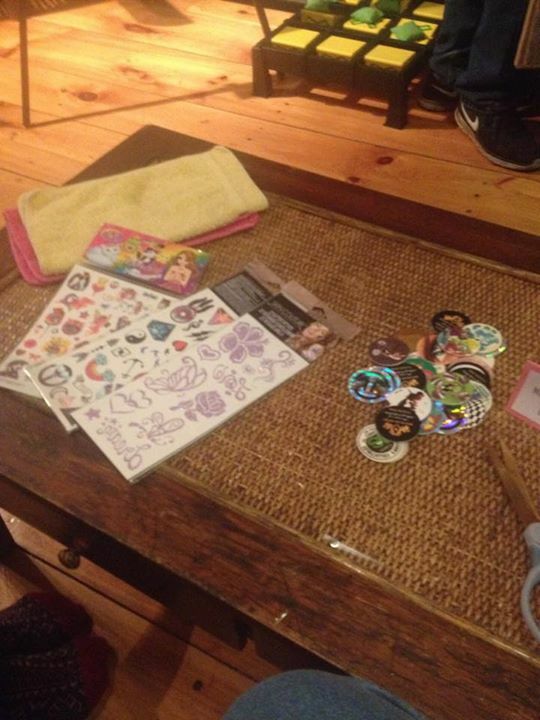 Those pesky pogs that nobody knew what to do with! I also bought cassette tapes that I made decorations with. Can you see the banner in this picture? Also a few small 90s images. To make cassette tape decoration I used neon spray paint I had hanging around my house, the kind dads use for construction things. I spray painted them different colors and then strung them on a string I made a few to put around the house, it was super simple! To make my 90’s photobooth I had purchased 90’s fabric from Etsy. I had my friend who is a graphic designer make silly signs people could hold up. They said things like ” Hit me baby one more time,” “Getting jiggy with it,” ” Alll that” “Boo ya” Other various funny signs. I set up my camera on tri-pod to make it really authentic, the pictures came out so funny, and it made it easy to set a self timer and to get everyone in the booth. I went through old photo albums and found pictures of me from the 90’s. I tried to find the most ridiculous ones. I matted them with neon paper. I use the di-cut machine at work and cut out letters that said ” The 90’s were good to me.” This was a fun personal touch to have! I had old dry erase boards laying around the house and found an old easel. I bought colored expo markers. 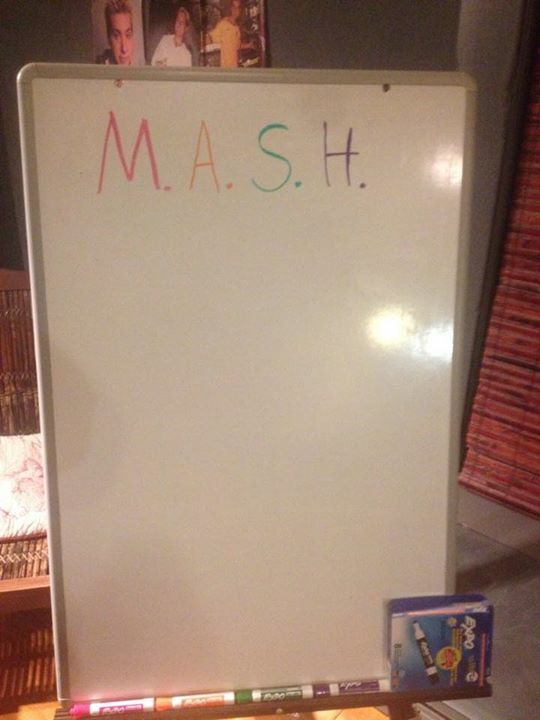 We played the old game “M.A.S.H.” on it all weekend. We also used it for 90’s trivia, I got the questions for it here. Party favors: Again Ebay killed it with this. I bought in bulk Tie-dye snap bracelets and press on earrings. Everybody had press on earrings as a kid. 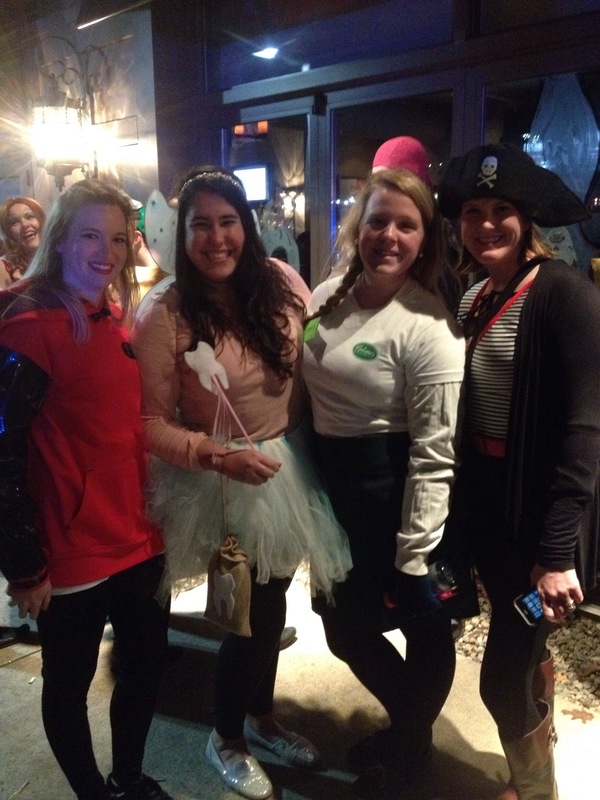 This was a fun thing to wear during the party and I let them take them home! The T.V. the entire weekend never played anything but the 90’s. I really wanted people to feel like they were truly in the 90’s. We watched early seasons of boy meets world, Mrs. Doubtfire, Free Willy, Matilida and Shawshank redemption. As for the music, I googled every article about good 90s music and spent hours downloading songs onto my Ipod, the playlist when it was finished was 5 and half hours. Its a crucial part of the 90s atmosphere. 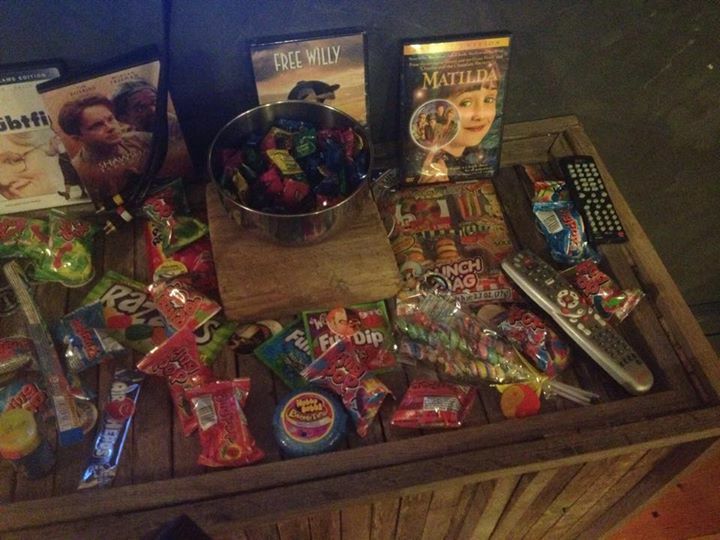 The food: I had warheads, ring pops (purchased at Sams) capri suns! Who knew that capri sun would be so good with vodka. I wanted dunk aroos but they were impossible to find, and I dont think that pinterest dip tastes anything like it. 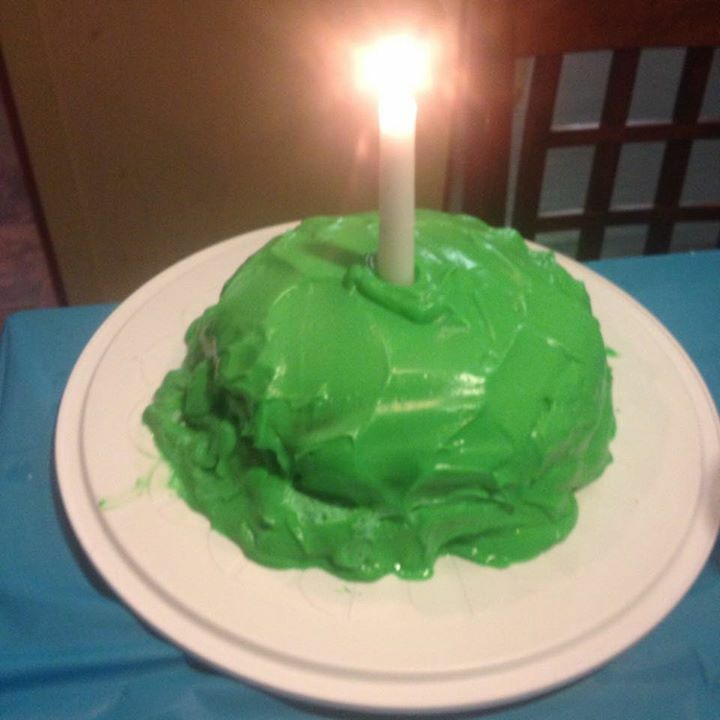 The cake: this recipe is literally from Nickleodeon magazine. Savers: Killed it. Even though it was from 2000 you know I actually found a BOXED J.C. Chaze no strings attached doll? The VHS were 99 cent each, and buy 5 get one free. I used the VHS for decoration because the house didn’t have VHS player. 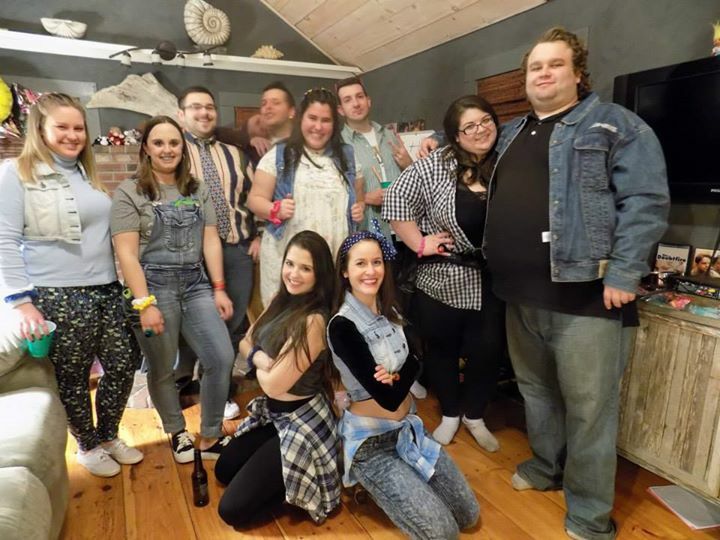 The biggest requirement of all for a 90’s party is ensuring that everyone dresses 90s. This was without a doubt the best part!! I bought most of my clothes from savers. I found socks with lace around the ankle at payless. I found jelly shoes on ebay and I regret every buying from this company. Horrible customer service. 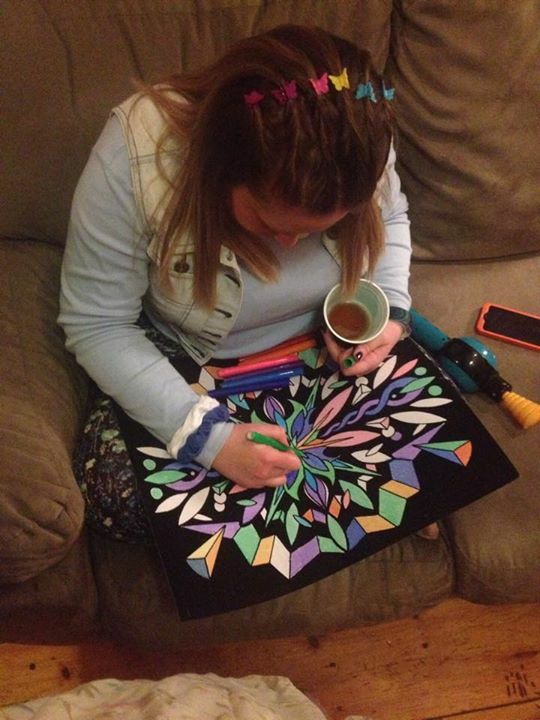 I found my scrunchies and butterfly clips on ebay as well. 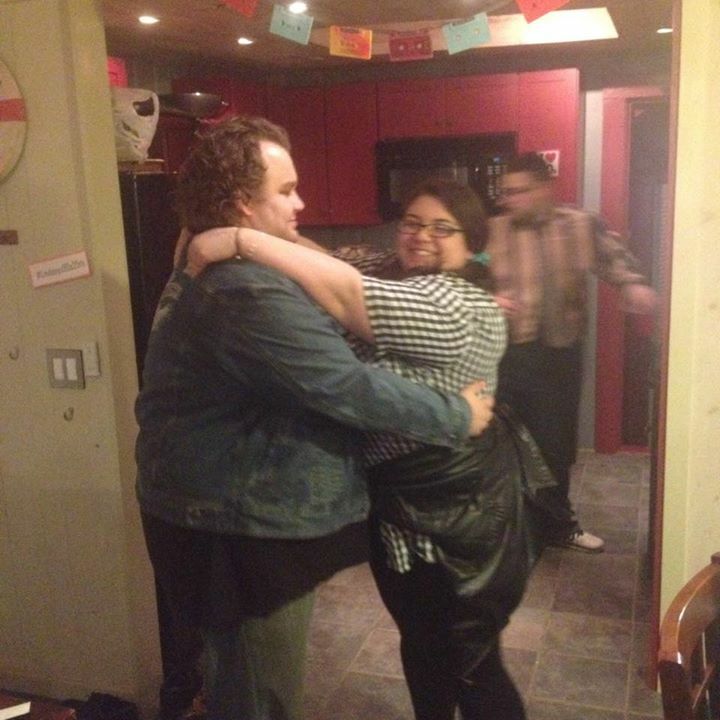 Overall this was an amazing party and I know we will be talking about it for years to come! I found out there is such a thing as fake pumpkins that you can carve!! 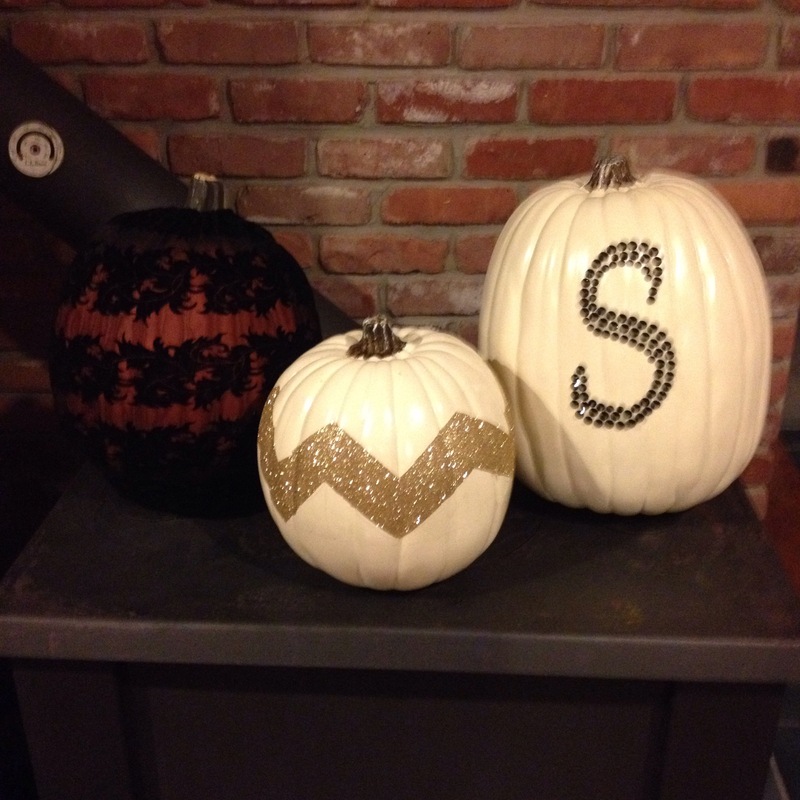 I went to Michael’s and Jo-anns and waited until these pumpkins were 70 % off. I felt so much pressure trying to decide what to carve them into, since it was permanent. Then I thought if I just added simple things to them, I could change them every year!! Martha’s stewart stuff was all 70% off which is amazing because her stuff is WAY overpriced. I bought what I could call a “pumpkin sock” in a pack of three. I Squeezed one over the big orange pumpkin, I am not sure if I am happy about how it came out, but I like it for now. She also had bedazzled letters on sale, which I purchased an S for my last name. Placed that on a big white pumpkin. For the small white pumpkin I created it myself. I created a chevron print, using a ruler I measured squares, then drew diagonal lines. I filled the lines with glue and then sprinkled it in glitter. Together the pumpkins even though all very different look pretty good! Next year If I get sick of the patterns I can take them off and carve them! OR re decorate! As always I made my own costume for Halloween night . 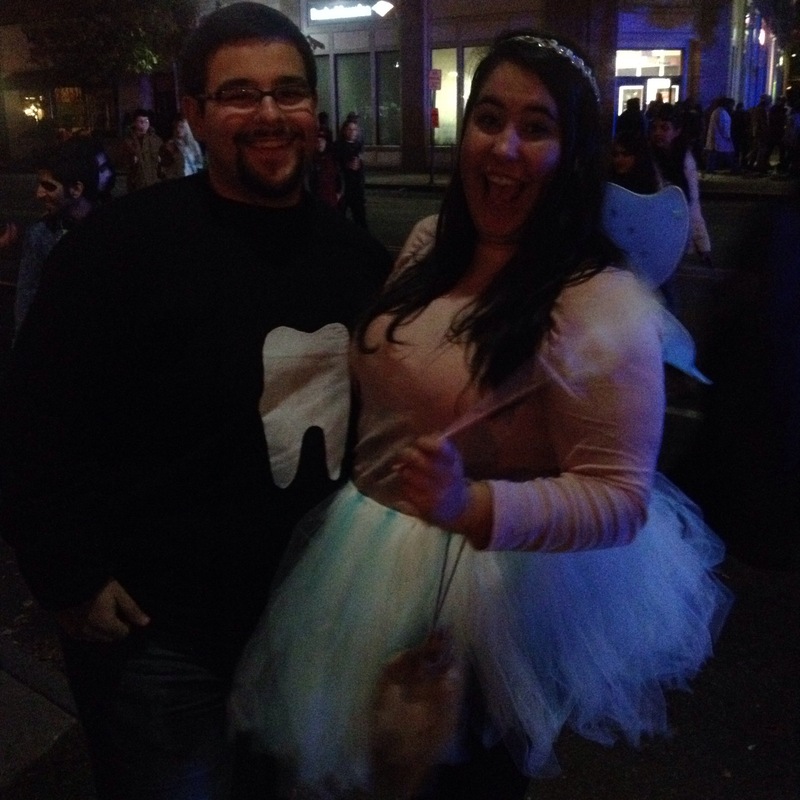 I have always LOVED the tooth fairy and thought it would be a perfect costume! 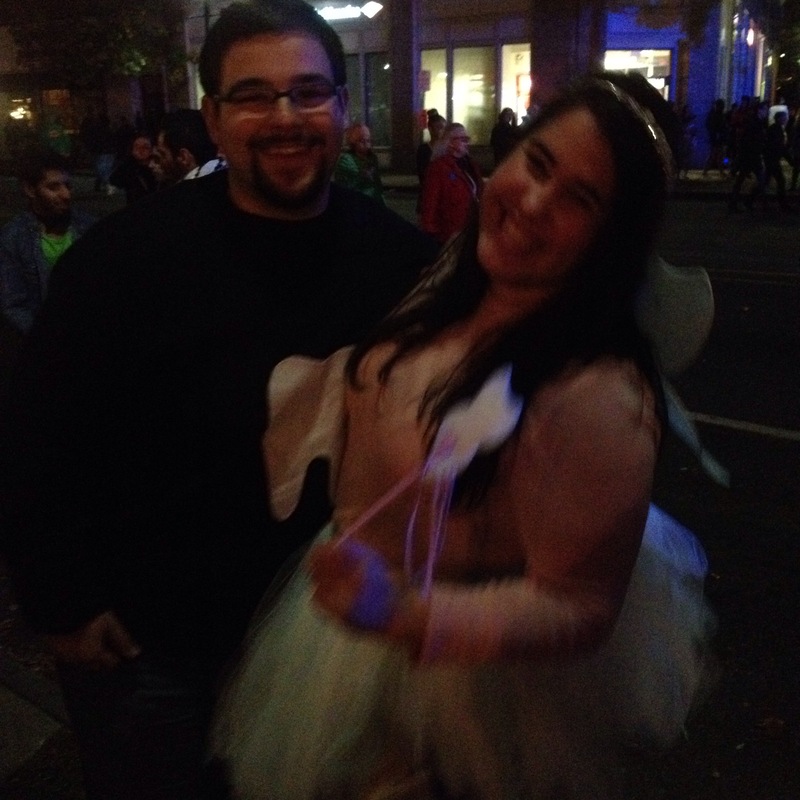 How ever I did not want to go over board with the fairy theme. I started with making my own tutu with silk ribbon and white and blue tule. I did small stripes of blue tule. For my fairy wand I picked up a wand from the dollar spot which was star shaped. I cut the white felt into tooth shape and trimmed the star so tooth would completely cover it. 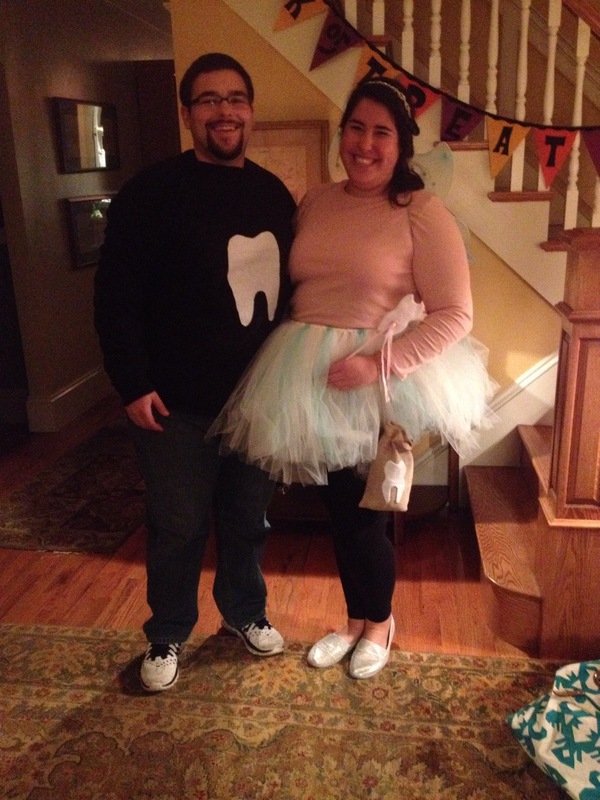 I wore a plain pink shirt and tutu over my leggings with sparkly shoes. I bought wings from eBay for 3 dollars !! In attempt to make a special Halloween, I took on making my buildings staff costumes. 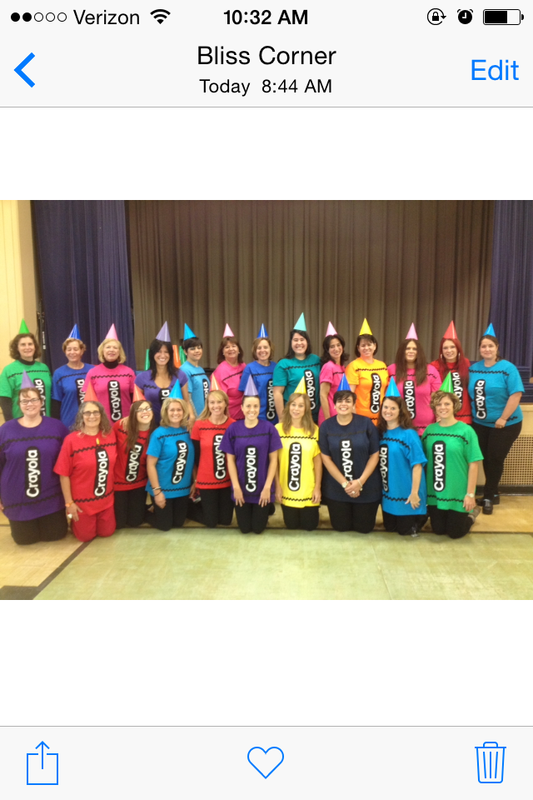 I had them all buy their individual shirts, give them to me and I would create them into a crayon! I bought large spools of black felt and white felt. and Lots of Jumbo rick rack! Our school has a di-cut machine where I cut out the letters Crayola with white felt. Then I cut an oval to fit the letters on black felt. I fabric glued the oval into the middle of the shirt. I glued Jumbo rick rack across the top and bottom of the shirt. I bought primary color party hats and covered the ones that needed shades that the pack didn’t come with. Simple costumes but in large group looked great! We had an asssembly and read the book ” the crayon box that talked” The kids loved it! 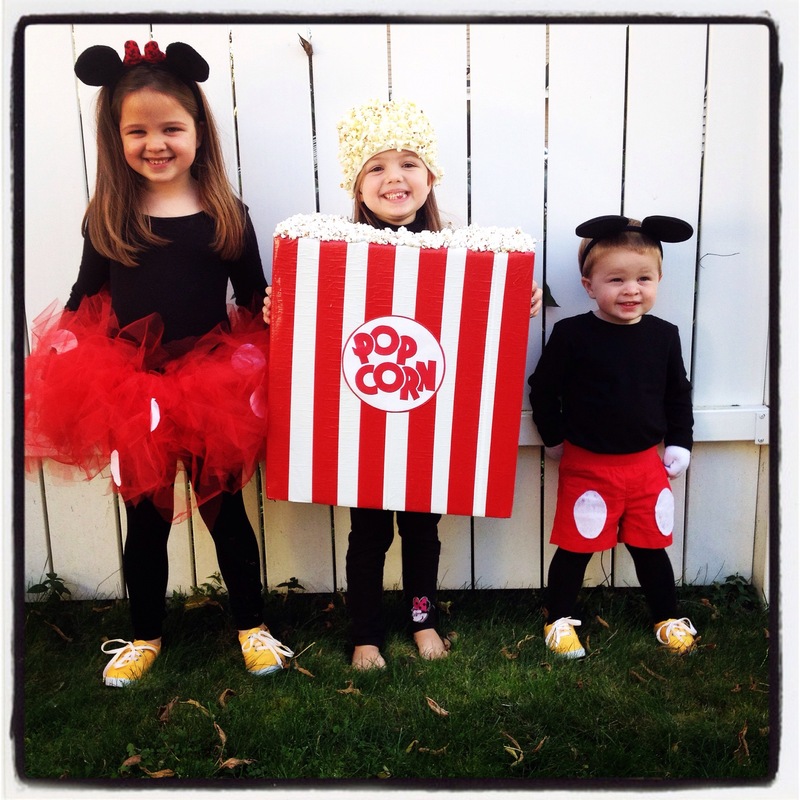 This year I convinced all 3 kids to let me make their halloween costumes. I showed them a few ideas on pinterest and let them pick. 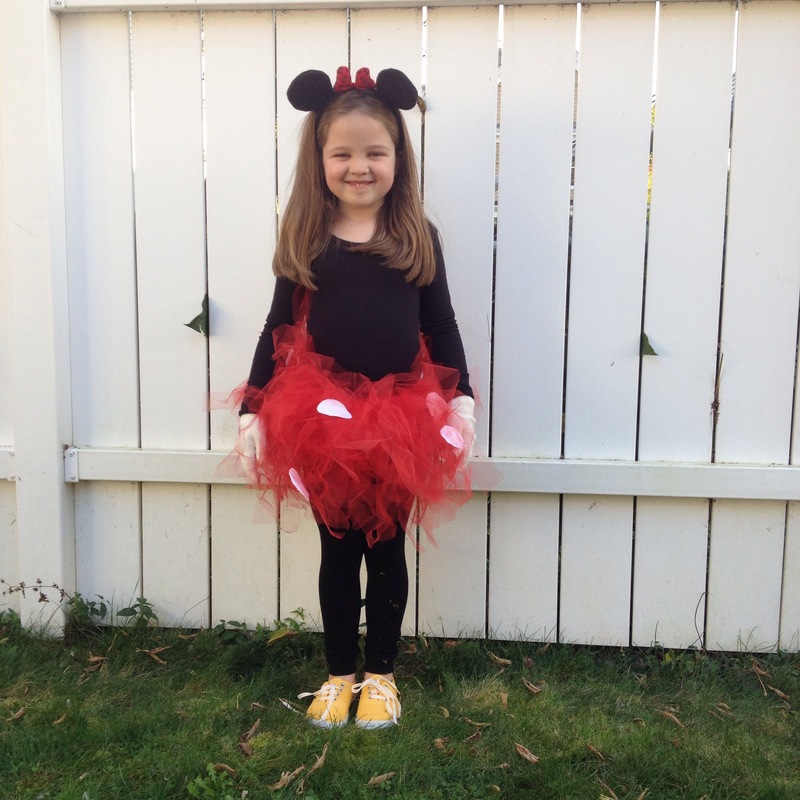 Audrey picked that she would like to be Minnie, and we decided that means Adam could be Mickey. Amy picked popcorn. So here began the DIY Process. I drove around to several stores looking for a box, a single box, you wouldnt think it would be that hard to find, between Walgreens, CVS, Cumberlands, New England Farms the final winner was a small convenience store in Freetown. I cut hole for Amys head and arms. I bought white duct tape and red duct tape. I covered almost the whole thing in white, and then went over in red stripes. I was one strip short and was upset when I had to buy whole new roll to cover that part! 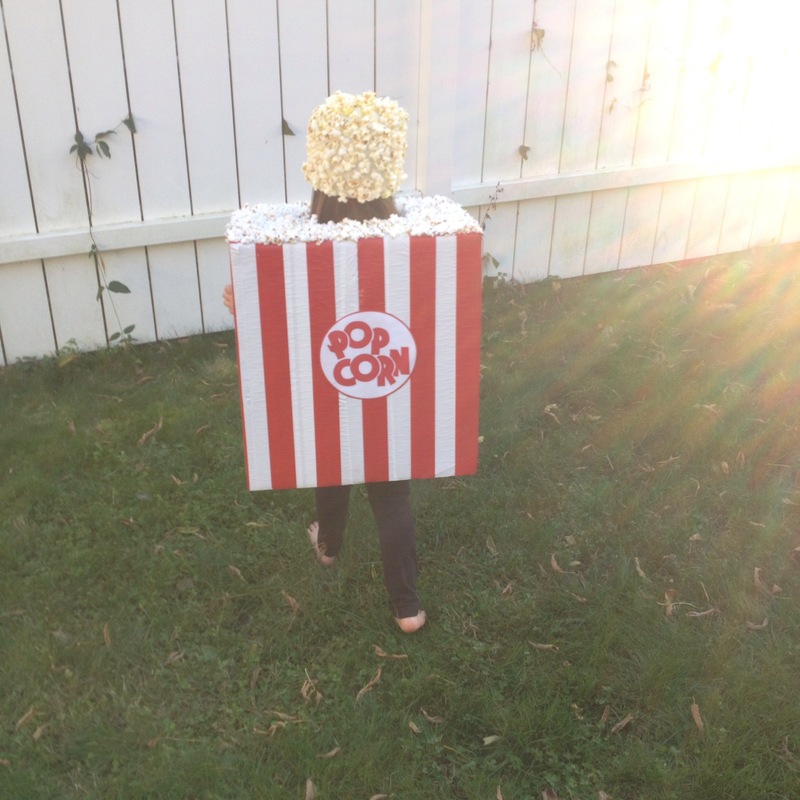 I began to hot glue pop corn all over the top of the box. 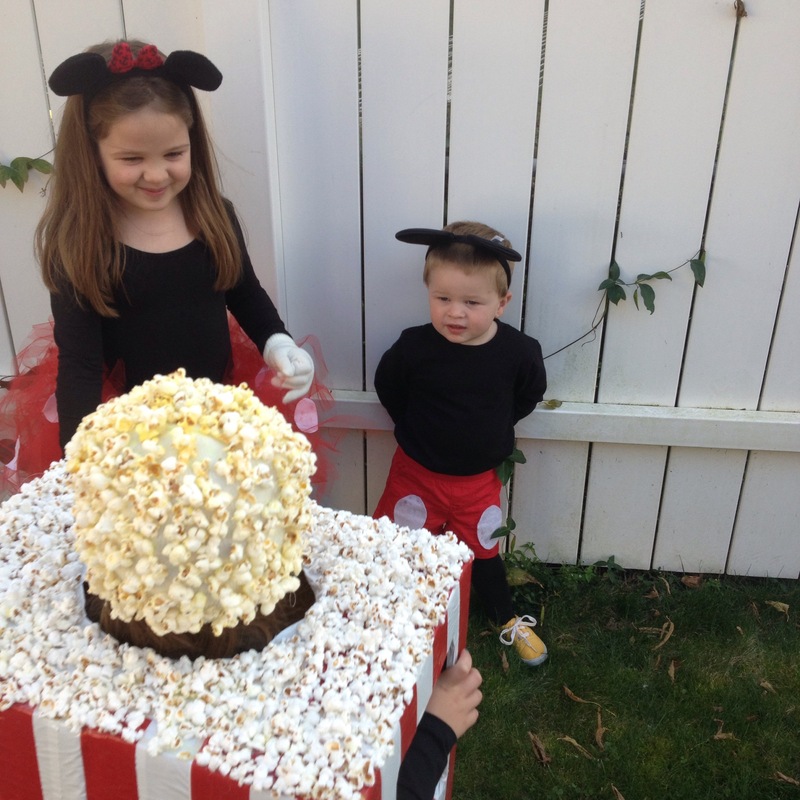 I bought a winter hat from walmart for 98 cents, and covered that with popcorn using hot glue as well! I printed the label to a pop corn box online, and taped it on both sides. Amy loved her costume, although she did say it was a bit heavy and it was hard for her to fit through door ways! Then I cut white fabric to polka dots and fabric glued them onto the skirt. I’ve found the cheapest kind of glue works the best. Forget fabric fusion, its the no- sew all the way. We bought a leotard and tights from Walmart. The ears I had from the ship. 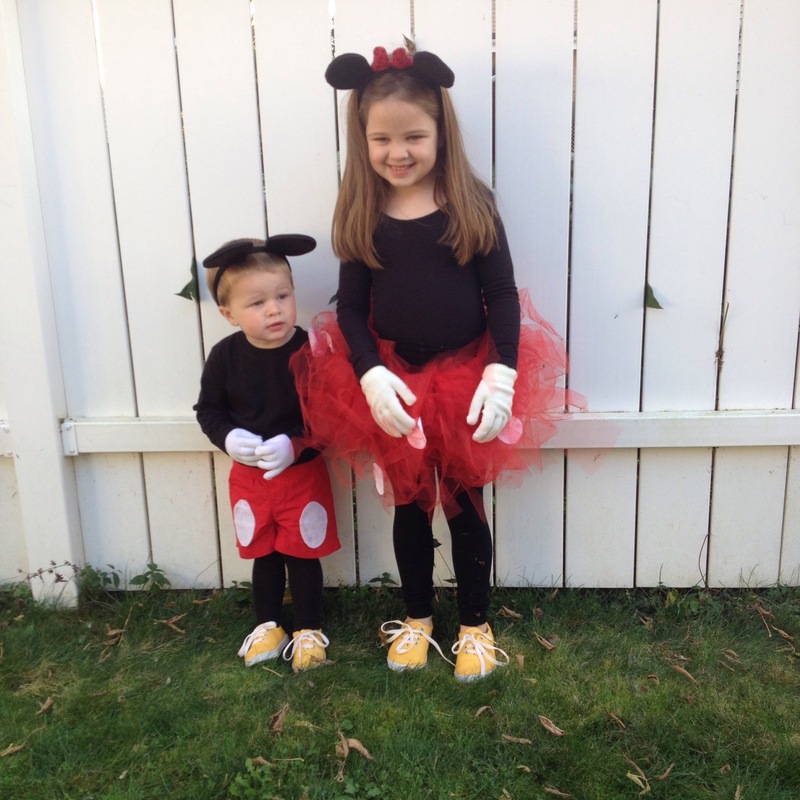 To make the yellow shoes- I bought plain white canvas shoes from Walmart for both Mickey and Minnie. I bought a packet of yellow dye, followed the directions, and dyed their shoes in the sink! The color doesn’t stick to rubber so they came out great. It didn’t stick to the laces either. Same thing we bought black shirt and black tights. 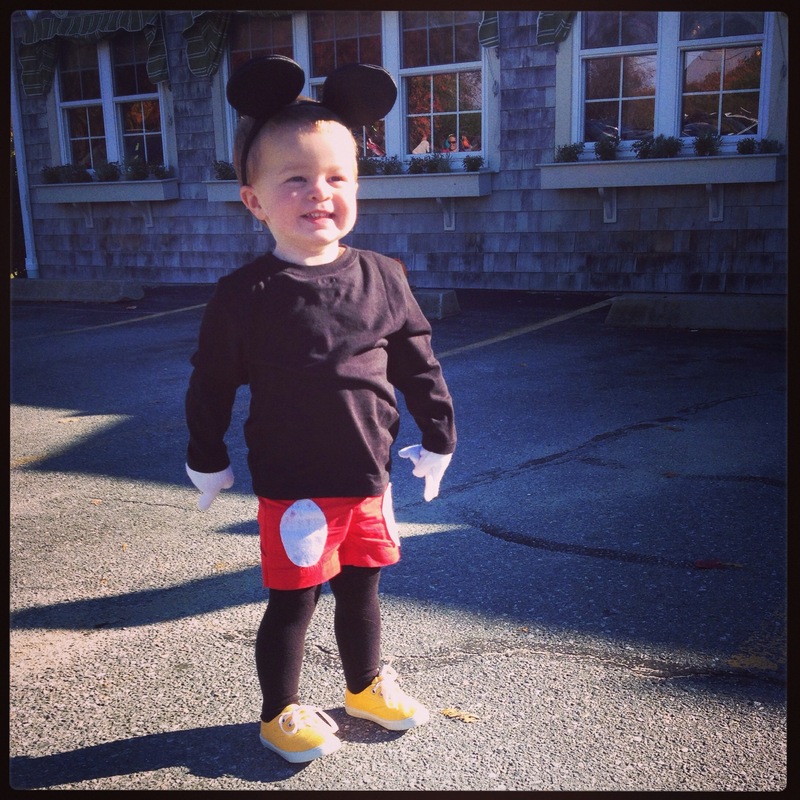 Mickey’s mom found red shorts on clearance and sewed them to his size. Then cut out white dots and glued them on. The ears we also found at Walmart too. WHite gloves were from walmart too! It was all very inexpensive! 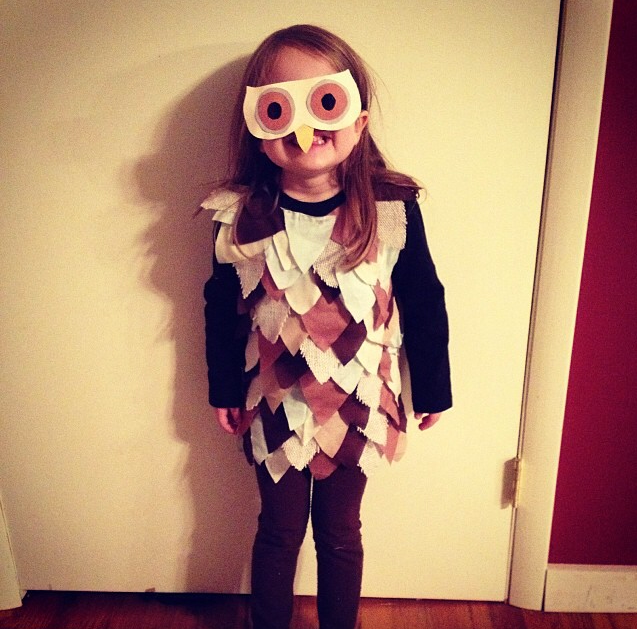 Last Halloween, I made Amy D. an owl costume! She loved it! I used this website. It was so helpful. 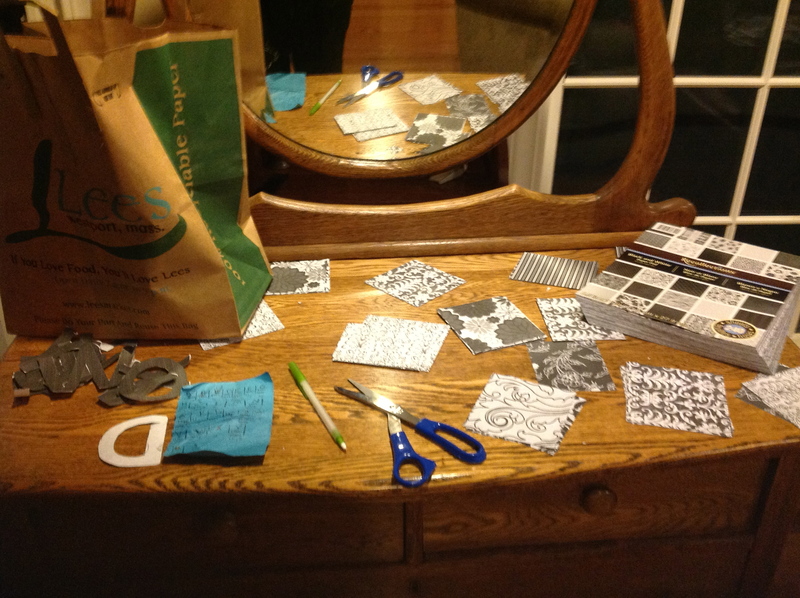 I ran to the store and bought fabric squares at Jo Ann Fabric and it was more than enough. I liked the tweed one and the different textures. I didn’t put it on a tee shirt, but on a long sleeve black shirt. as I looked at the picture longer I realized they glued it on a tee shirt and cut off the sleeves. Either way it works!! 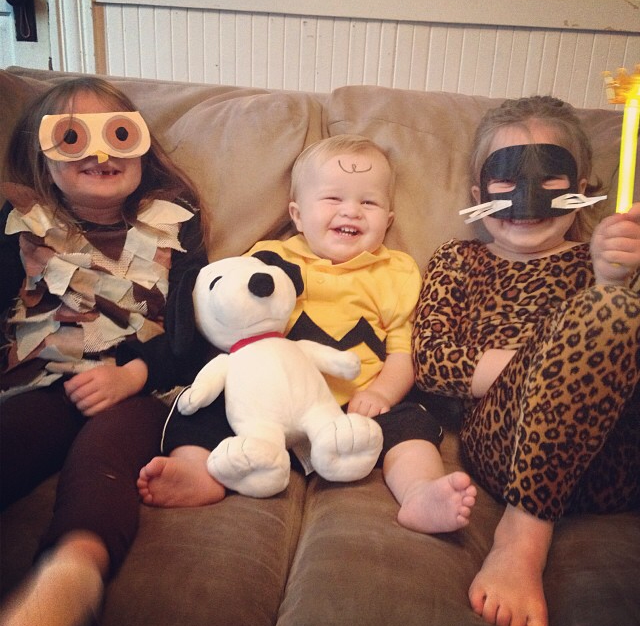 I also quickly made Little Adam a Charlie Brown costume out of a yellow tee shirt and black zig zag. It couldn’t be cuter!!! 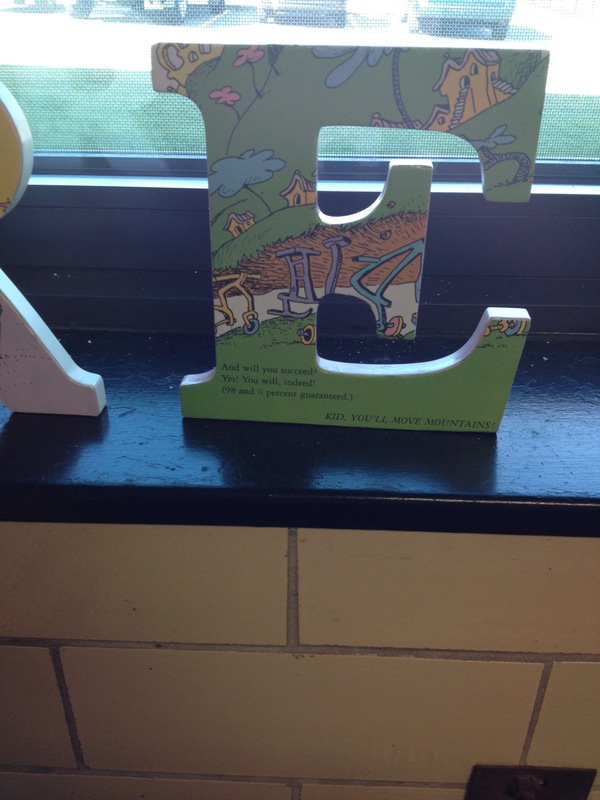 I saw an idea on Pinterest, where somebody took the letters “READ.” and covered them with pages from a Dr. Suess book. 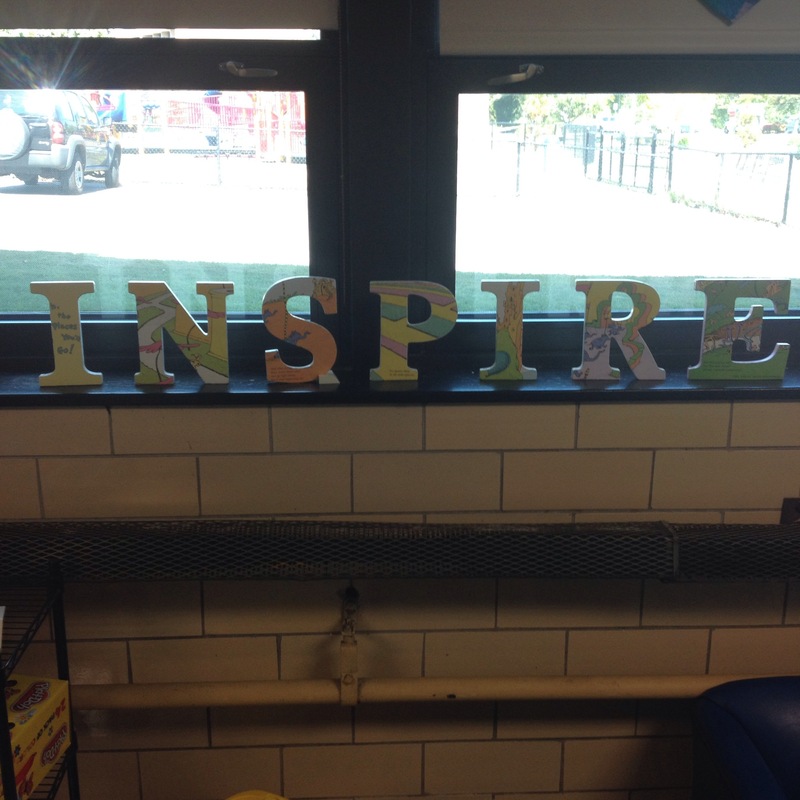 This got me thinking, how could I apply this idea to my classroom? 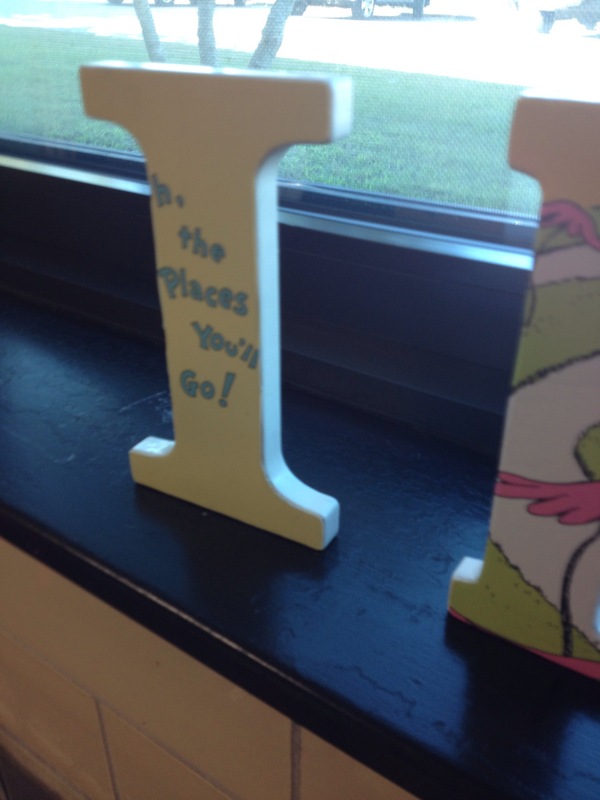 I had a big window sil where I could place the letters, I just had to pick a word. Since I am a speech pathologist assistant, I knew READ wouldn’t be appropriate, and SPEAK was pretty silly. haha. 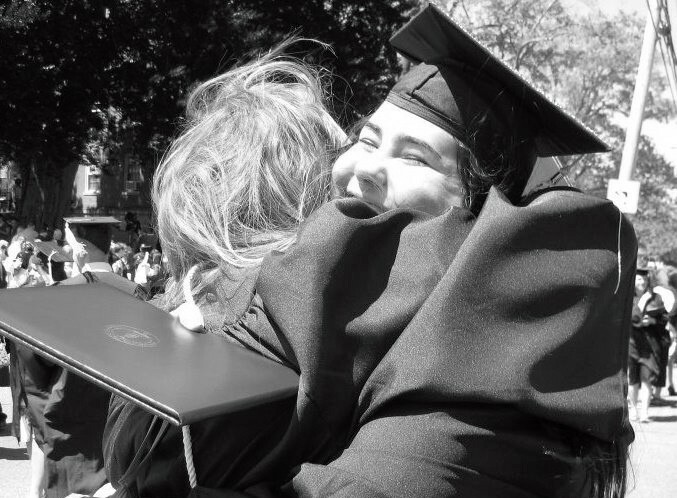 So I immediately thought of The book “Ohh the Places You’ll Go.” Which was book that my mom gave me for high school graduation. Then I read it to my brother on the day of high school graduation, and again on my college graduation. The book Inspires me, so I thought what a great word to have covered in pages of Dr. Suess. This would serve as a daily reminder that my life has come full circle, I am now teaching Dartmouth children, when I myself was a product of Dartmouth Schools. It would inspire me to give the children I service the tools to succeed. 98 % and 3/4 Guaranteed. I began with buying block letters that could stand on their own from Walmart.com. They were 1.88 a letter, I couldn’t beat the price. I bought a used copy of the book off Amazon.com. I decided to go in order of the book. The first letter “I” is the title of the book, and the last letter is one of the last pages of the book. 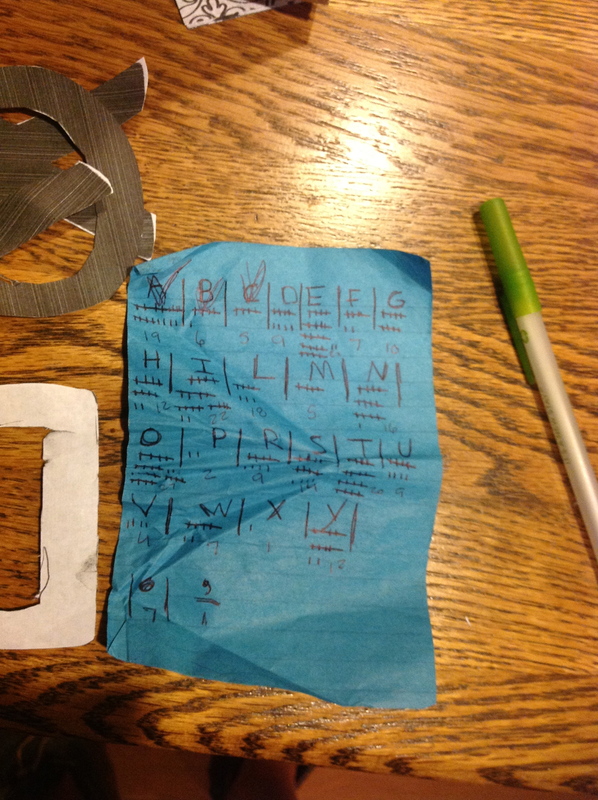 To begin, I ripped out the page, from there I flipped over the letter and traced the letter onto the page. I cut out the letter and applied modge podge onto the letter and carefully placed book page onto letter. I repeated for the next letters. Then I noticed some edges were not lined up perfectly, the page would go over the letter. This is when I took the razor blade and trimmed the edges. Then I modge podged over the top, to make a smooth protector coat. It came out wonderfully! People have already asked to make me letters for them! 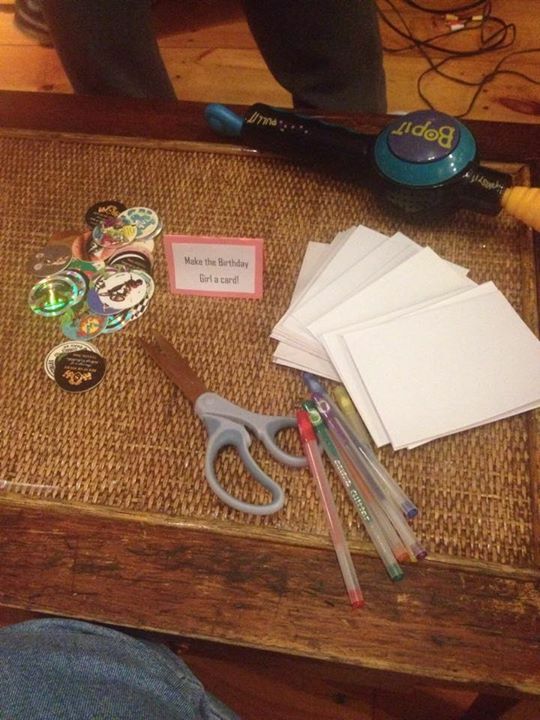 There are so many combinations to do this project, maybe you can use multiple Dr. Suess books, or any books at all! 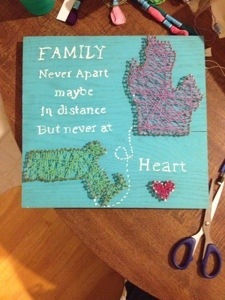 I wanted to try string art, and so I came up with a little present I could send my cousin. She lives in Michigan and I live in MA so I thought I could do both states with a cute quote. I started off with tracing the states from the computer and cutting those out, and then using them to nail around. 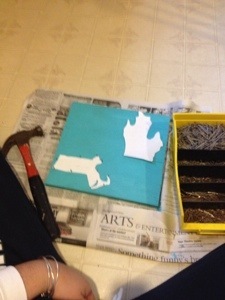 Of Course I recommend “anchoring” the picture with a few nails around. My materials I used were nails my dad had in the garage. Some people use fancy craft store nails but I didn’t find it necessary. I think the trick to the nails are to have a big head and short body. I painted a old piece of wood for the base. The string I used was not the thin kind of string some people used. I just bought a bag of the string you make friendship bracelets out of. Then the nailing process began, I just put nails as close together as they could be and to be honest it was exhausting. Once both states were nailed, I ripped them off the board. There is no rhyme or reason or pattern as to how I did it, I started with a knot to begin and rolled with it. Whatever looks good go with, I did no exact pattern, some people don’t cross over but I saw do whatever you think looks good! I finished it up with some paint, but using carbon paper my dad gave me I was able to trace a nice font and transfer it to my art and then paint over that. I sent it to my cousin in Michigan for christmas and she loves it. I am so happy!!!! I look forward to making more string art for different reasons! I saw this idea, back when I was a senior in college. Brilliant, your headphones wont tangle, and no more fighting over who’s headphones are who’s when yours look like this. I always called this knot a turnip, but I guess its mostly called chinese staircase, its the easiest thing to do, with the prettiest effect. I am not going to lie, it took me a few hours to finish this headphones, but it is so worth it. I chose whatever colors I wanted. Some people use color fading string so they wouldn’t have to switch colors but I didn’t have this choice. I can’t explain my methods but here are some methods you can try. 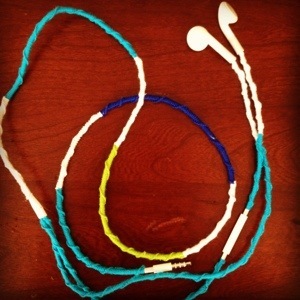 I used one string at a time, tied knots and switched off colors, I didnt wrap other colors underneath, you will find the method that works best for you. I don’t know what I was thinking when I started to do this one. 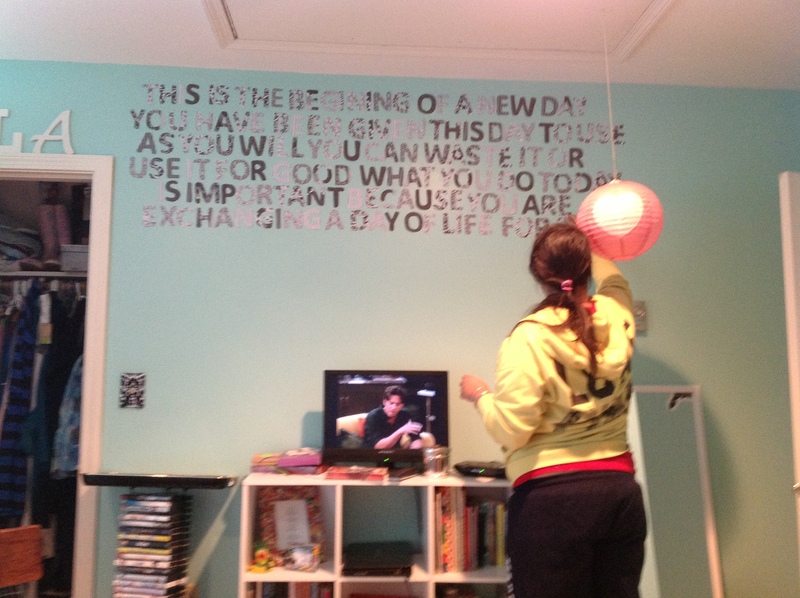 I had a very large wall that I really wanted a wall quote on. I searched far and wide for ideas, you see many pictures of wall quote on tumblr cut out of magazines, I have tons of magazines, but magazine pages are thin, and I just didn’t like the idea of searching for good pages, and all the unwanted colors that come with it. I found my quote, and I think I picked the longest quote in the world, but it was something that I would like to see every day when I woke up. It’s all about the inspiration. I thought about what I would use on it for a long time. I decided to find a pack of scrapbook paper. 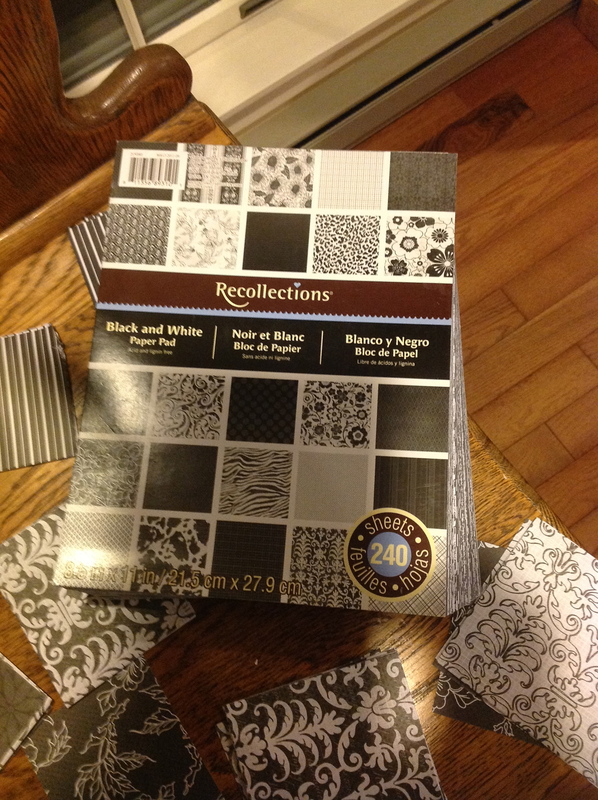 I went to two Michael’s and finally found “the one.” Black and White floral, paisley, stripes, all that good stuff you would want in a paper pack. I also got it 50 % because the paper packs were on sale but I printed the weekly coupon just in case. Michael’s weekly coupons are where its at. 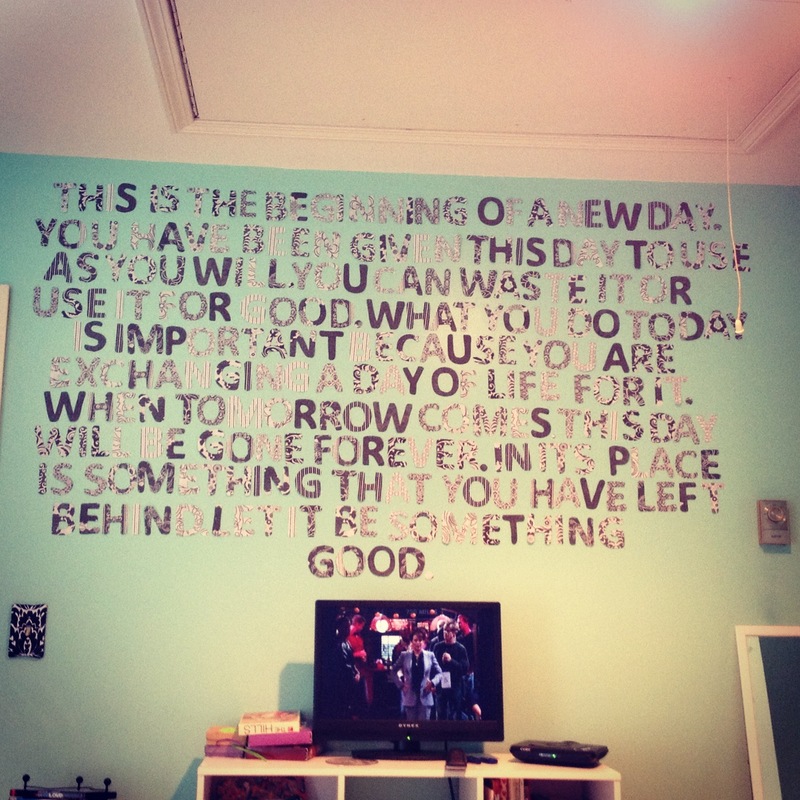 So I counted all the letters that this quote had, 27 E’s. 27 E’s SO you can imagine how many more letters there were. I cut each paper in sections of four. Using my dad’s Paper Chopper. Then I went and found font that I really liked and in the size I wanted and printed that and used that as templates for the letters. Then I painstakingly cut out EVERY. SINGLE. LETTER. it took me two days. I then arranged them all over my living room floor, so I could measure how wide and tall it was across. This was a very very exhausting task, I dont really recommend this project to anyone. Well I do, if you use a smaller quote. I began putting this project on my wall yesterday, as my best friend kelsey sat on my bed and kept my company, we watched Dan in Real Life and the Nanny Diaries, before I even finished half. She also laughed when I chose to use a old rocking antique chair as a ladder ( few close calls there). I used sticky tack to apply the letters. I measured where I wanted it on the wall, about three inches down. I didn’t measure the rest of the lines after that because that is exhausting. Today, my friend Erik came over and clicked a few pics of me mid project. We watched Will and Grace our favorite show as I finished it up. I am very happy with it, its kind of hard to read, but I kind of like it like that. And its a good reminder to wake up to every morning. I also decided to move the pink lantern I have had hanging from attic since high school. My best friend gave it to me for Valentines day. This was way back in the day before we could drive, and I remember this because my mom took us to Walmart and we snuck around the store and bought presents for each other, and gave them to each other right after. I think I will hang it in my closet. But I love that little thing, so I cant bear to get rid of it.